The most important part of my work is connecting with and serving you. It’s been my mission from the start to share my experiences in simplifying my life for more space, time, love and health to ease your pain, and inspire your journey from being overwhelmed to finding peace. I can write to you and for you, but there is magic in conversation and one on one connection. Whether it’s via email, Twitter, or comments here on the blog, those interactions are powerful and have been the core of our beautiful community. Sometimes I lose my mind trying to keep up with all of them while considering new emerging platforms. There are days when I miss having just one social media account. 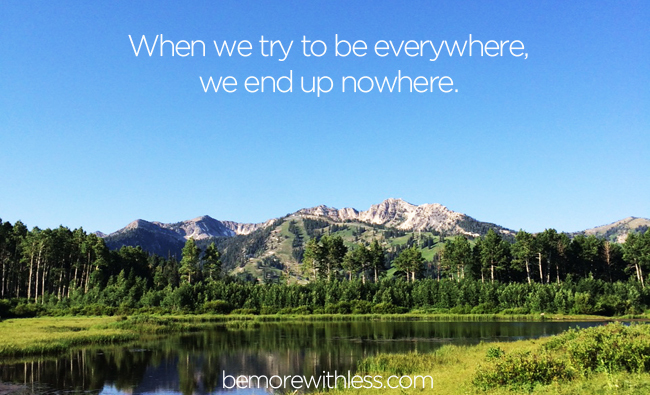 We might feel like we are missing out when we aren’t connecting on all the different platforms, but when we try to be everywhere, we end up nowhere. Instead of passively scrolling through your social media feeds killing time, set a timer. Think about what you want to contribute or take away from your timed session, and close Facebook or Instagram when your time is up. Consider 1-2 short sessions a day instead of mindless checks all day long. Once you schedule your timed sessions, you can turn off all distracting notifications. There is nothing you need to be alerted about. Really … nothing. Take responsibility for what you share and know that even with privacy settings, it’s possible that anyone can see what you share on the internet. If that’s a deal-breaker, close your account. Otherwise, be kind, helpful and consider this when sharing your life on the internet. If you can’t be kind to your friends, be quiet. If you are connected to people on your personal Facebook page who bring you down, or waste your time, silently wish them well and unfriend or block their updates from appearing on your feed. It may actually improve your real-life relationship with them. If you’ve joined pages and communities over the years that aren’t serving you today, say goodbye and unlike the page or group. Edit and curate your feed so you get exactly what you need. If you’ve liked pages and notice that you haven’t heard from them in a while, visit those pages and engage. Like, share and comment on the pages that add value to your life and Facebook will start sharing things from those pages in your feed. Skip Facebook and other social media for at least one day a week. If you have the Facebook App on your phone, remove it for 30 days and intentionally sign into Facebook for your timed sessions. This will help prevent the mindless checking. This is exactly what I need! I spend lots of time on my personal FB, but don’t focus on my business FB pages at all! I want to offer content in a thoughtful way, expand my use of Instagram and Twitter, and focus on starting a second business about which I am passionate. Thank you for all that you write…you inspire me to become a better and more consistent writer as well as a successful minimalist! Thanks Kathleen, happy this is helpful for you. I admit that I really don’t have a desire to be involved in all these different social media accounts. I like reading and posting on blogs… and that’s it! No FB, Twitter, Instagram or anything else. I realize that this could limit my growth for business opportunities, but it is just too much in my opinion and goes against my principles of simple living. It’s great to know your limits and align with your principles! I can’t stand facebook. All people seem to do is brag about their lives. So I won’t be joining you there! lol I’ve recently discovered Instagram & love it so much. My instagram feed is filled with great design & foodie pics, they make me happy & feel inspired. I guess I’m a more visual person. whatever, it works for me at the moment. Thanks Sharon, Facebook is not for everyone, and I am definitely not encouraging people to join – only to connect if they are already there. I love Instagram too! So smart to find a platform you love and ignore the rest! I have a feeling I’ll be doing more of that with this experimenting. I found that editing my newsfeed really helped the time I spend on Facebook more enjoyable. Usually, when I see something I don’t care for, I’d just scroll past it. Now, I will put in the extra effort to hide that post or unfollow that person because even if it’s something minor, I don’t want to have to experience anything negative if I can control it. Also, I turned off all notifications on my phone. Now, I spend less time on my phone and experience less distractions. It’s so much easier for me to remain productive. What a great idea Courtney! As someone who is in the marketing field and legitimately needing to be on various social media channels any given day to engage with customers for my clients or schedule their social media, I SO struggle with this. I sometimes justify being on my personal accounts longer than I should because I usually tell myself that I’m there anyway, so what would 30 quick seconds of checking hurt… and then before I know it, 15 minutes have gone by completely wasted. What great advice. Personally I’m only on instagram (I do have Pinterest and Google+ but never use them). I find it hard enough to keep up with the one platform and am thankful I don’t have the others. I rarely feel like I’m missing out and honestly feel like my life is quieter without all the social media. Super looking forward to your 21 Day Programme! I love this idea! 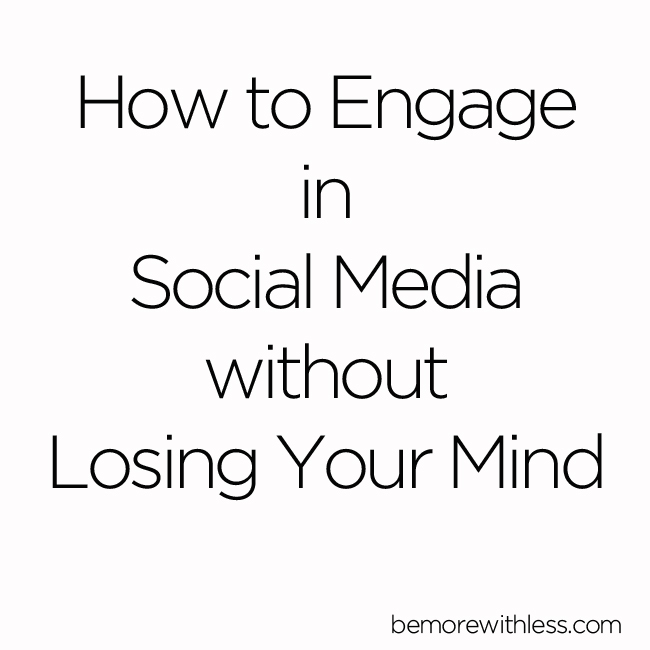 It’s really easy to get overwhelmed by all the different social channels and I intentionally focus on only a couple (even though I have a presence on about 5). I’ve been considering lately to remove my FB page altogether and just focus on my favourite channels – Instagram + Pinterest. Looking forward to hearing how your experiment goes! This is an interesting idea, and a good way to figure out which platform holds the most meaning for you. I have accounts on most of these various platforms, some are used and some are not. I like the idea of figuring out which I truly like and getting rid of the rest. This post was just what I needed today, Courtney! I struggle with being consistent on my business social media profiles. (And coincidentally, I had decided to start being more intentional and consistent with them, starting today.) I also wander aimlessly through Facebook and LinkedIn, trying to figure out what to share or comment on, so I think a timed session is a great idea! I’ll implement that into my social media marketing efforts today! Thanks for the insight! Seems like this was written for me :). Thanks for every nugget of wisdom you share in all your blog posts.